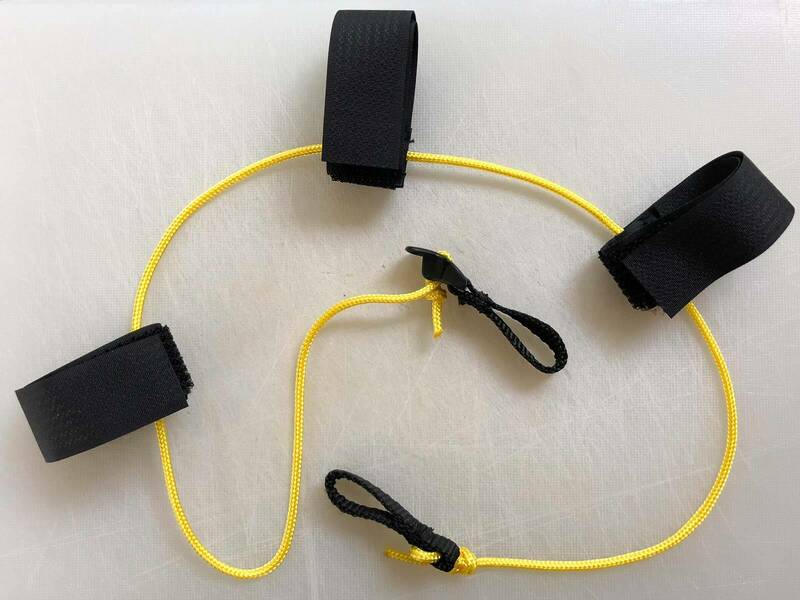 Hi, know this is a few years old but looking at a MLD supermid for here in New Zealand, need it to be able to handle some serious wind (potentially 60mph+); do you think with all guy outs used it will be ok? If you leave your cooking ware outside of your tent at night, the ‘meese’ will jump in and out, looking for tidbits that remain from your high-end Mountain House Turkey Dinner. I just put all food prep stuff in a stuff sack and hang it high and outside. Some critters like to seek and eat food at night when I am trying to sleep. Your reviews are excellent Some of these tents are rather expensive, but that is not your fault, just the nature of the industry. Thank you for incredible effort and understanding of gear. Nice! !…you’ve convinced me to take the Solomid route but what I don’t get my head around is tarps like this: https://www.ddhammocks.com/be/product/DD_Superlight_Tarp?from_cat=33. Big as a castle, cost nothing and versatile. 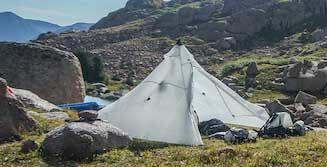 As a European (there is no such thing as UL backpacking, yet) it’s hard to understand the light equals costs thing there is in USA made tents. Steven, if you think you have the skills to use a a big tarp go for it. They do require some skill to pitch and are not as wind and snow resistant as Pyramid shelters — but they work! Ounce for ounce, tarps are the lightest shelters out there. They give great views and have great ventilation. Pitched high they have a ton of livable area. Pitched low the provide good protection from wind and rain. Tarps like this take up little room in you pack and can be pulled out of a outside backpack pocket and pitched in jut a few minutes to weather a rain burst. Then they can just as easily bet folded back into an outside pocket of your backpack — away from all your dry gear inside the pack. Price in consideration it’s hard justifying a Solomid…need some more research. I just got a duomid xl. having a little trouble lashing my trekking poles together to keep the pitch taught. any suggestions or strategies you usually use? 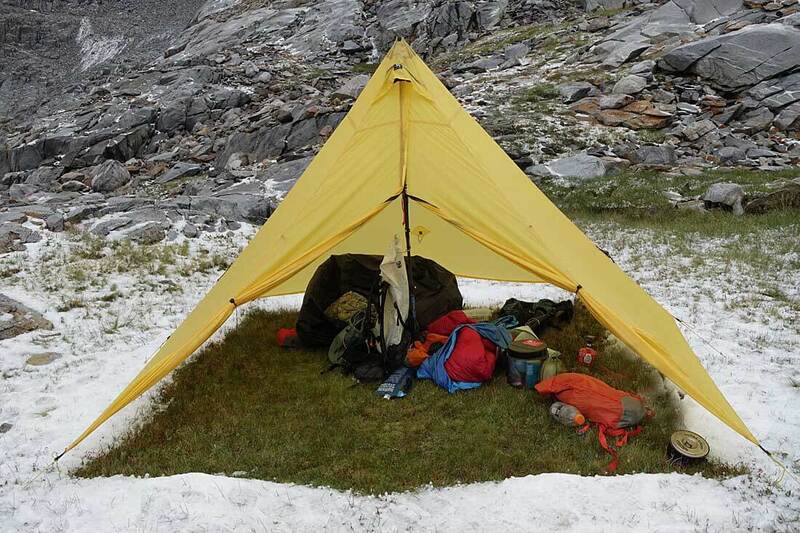 Would you use a pyramid shelter on a 4-season (think 2-3 day snowshoe) trip, or if not, what would you consider? Ideally I’d like to have one shelter for all seasons. Thanks for your reply! Hope you have a great weekend. I’ve been eyeing the MLD pyramid shelters for quite some time. It seems like you’re a fan of mids as a shelter for almost any set of conditions. If you were taking a shelter for two in the Sierras for 3+ season use, would you reach for the Duomid XL or the Supermid?